1: Cases by Intervention Node. 1.1: Node 1 - Turkey. 1.2: Node 1 - Brazil. 1.3: Node 5 - Greece. 1.4: Node 5 - Philippines. 1.5: Node 5 - France Indochina. 1.6: Node 8 - Dominican Republic. 1.7: Node 8 - Lebanon. 1.8: Node 9 - Congo. 1.9: Node 9 - Cambodia. 1.10: Node 10 - South Vietnam. 1.11: Node 11 - Cambodia. 1.12: Node 12 - France Indochina. 1.13: Node 12 - Laos. 1.14: Node 12 - Nicaragua. 1.15: Node 12 - Zaire. 1.16: Node 13 - Haiti. 1.17: Node 15 - British Guiana. 1.18: Node 16 - South Vietnam. 1.19: Node 17 - Syria - Case 1. 1.20: Node 17 - Iran. 1.21: Node 17 - Syria - Case 2. 1.22: Node 17 - Ghana. 1.23: Node 18 - China Tibet. 1.24: Node 18 - North Vietnam. 1.25: Node 18 - South Yemen. 1.26: Node 18 - Nicaragua. 1.27: Node 18 - Libya. 1.28: Node 19 - Indonesia. 1.29: Node 19 - Soviet Union Afghanistan. 1.30: Node 19 - Vietnam Cambodia. 1.31: Node 20 - Germany WWI. 1.32: Node 20 - Germany WWII. 1.33: Node 21 - North Vietnam. 2: Cases by Alphabetical Order. 3: Cases by Chronological Order. 1) Declaration by Smith on behalf of the U.S. , 21 July 1954, FRUS 1952-1954 , vol. 13, pt. 2: 1860; also 1733, 1734, 1748, 1752, 1754, 1758, 1774, 1791, 1828-9 (all on acceptance of partition); Gibbons (1986: chs. 3-5). Even if one accepts the argument that the U.S. never intended to use its own troops in 1954 (Porter 2005: ch. 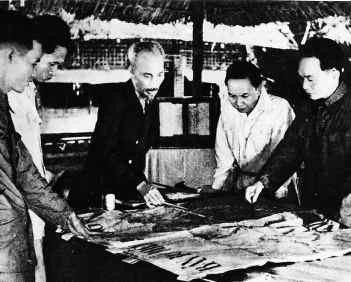 3), the arguments against combat forces and the conditions attached to the offer of such forces both hinged on granting genuine independence to the Indochinese states.